A potential transportation funding mechanism recently outlined by Sen. Nichols (right) has been introduced as proposed legislation. North Texas Senator Bob Hall, a member of the Transportation Committee, has introduced SB 84 in the 2017 Texas Legislative Session. It would allow TxDOT to select one pilot project to be funded from the growth in state sales tax revenues within a specified impact zone surrounding a new nontolled highway improvement project. The introduced bill can be downloaded here. "The cost to preserve the system goes up every year and increases with age." UPDATE: North Texas Senator Hall introduced SB 84 in the 2017 Legislative Session to authorize a single pilot project to test this proposed funding mechanism. It was heard by the Finance Committee and left pending without action. Senator Robert Nichols expects the Legislature to take a fresh look at an idea aimed at funding critically needed highway projects in very high growth areas. Nichols, chairman of the Senate Transportation Committee, recalls the proposal was first raised a decade ago by former Sen. Steve Ogden, then chairman of Senate Transportation. It would allow establishment of a zone of perhaps one-half mile on either side of the needed roadway project. The Comptroller's Office would certify the amount of existing sales tax receipts from the zone. Then a portion of future state sales tax growth within the zone would be captured for a set number of years to help pay for the project. Local communities would have to initiate the project, participate with a portion of local sales tax growth, and partner with TxDOT. The funds would come from new business activity that was in part a direct result of the highway being built. Nichols said he would prefer that this be done without forming new districts or creating a new bureaucracy. "I think it is a real possibility. It would be a significant new future funding source and would be very local," he said, noting that it would likely require a constitutional amendment. He stressed that an amendment would require broad support in the Legislature which must approve by a two-thirds vote. Chairman Nichols said he believes that it is important for Texas to continue allowing local communities to build toll roads when those communities believe it is appropriate to provide improved mobility now rather than years in the future when funds become available. 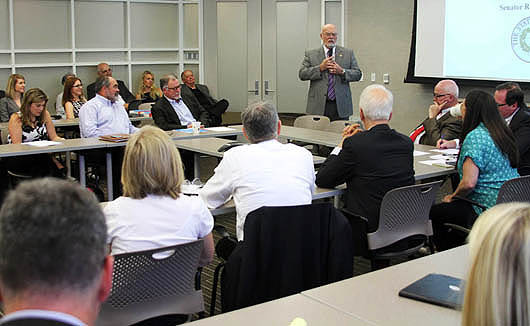 Nichols, a primary author of Proposition 1 and Proposition 7, was speaking to members of the Transportation Advocates of Texas at a recent gathering. He extended his thanks to TAoT and member organizations for helping win high voter approval for those two highway funding constitutional amendments in 2014 and 2015. He said that Texas now has a great diversified portfolio of revenue sources for state highways and that the new voter-approved mechanisms will increase funding over time. He said he will work to preserve the funding tools that many worked hard to put in the toolbox. "There was a need for them and it does not disappear at this point. But possibly there will be less dependency on them moving forward," he said. Nichols said that now that additional highway funding is coming on stream he hope there will be less need to use tolling as a tool to deal with congestion. "My hope is that we would not lose some of the tools that we've got." He pointed out that more than 9 million vehicles in Texas (38%) now have electronic toll tags, suggesting that many urban drivers want to use toll roads because they want to get home. Chairman Nichols said he expects to see legislation in the coming session dealing with toll projects including "toll system financing" in which a local toll agency uses income from one project to help build other local projects. He also expects a bill will be filed proposing to eliminate tolls once construction bonds are paid off. He warned that ongoing maintenance costs over the life of such projects are much higher than the initial cost and wondered how those costs would be paid if tolls were terminated on a sprawling system like the Harris County Toll Road Authority. Nichols presented a set of charts putting highway funding issues in perspective. 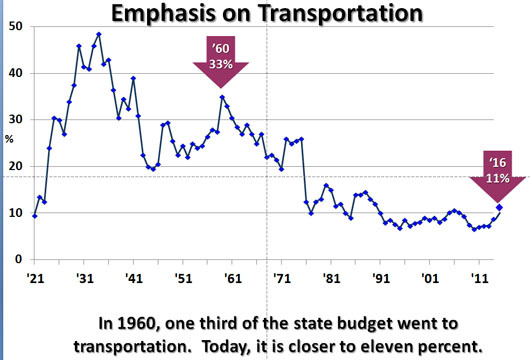 The first shows that the emphasis on transportation as a part of the state budget has declined over the past 50 years from about one-third of the budget in 1961 to a low point of about 8% in 2009. A decisive moment came in 1971 with a decision to de-emphasize highway funding. Over the following decades the state focused on highway maintenance rather than new capacity even as cities grew and the number of vehicles increased dramatically. Nichols, a member of the Transportation Commission from 1997 to 2005, said that funding became so dire by about 2010 that the Commission divided state highways into four categories, postponing maintenance in the lowest category. The public and elected officials need to better understand how much it costs to maintain and preserve the 80,000 miles of highways that are already on the state system. The cost to preserve the system goes up every year and increases with age. He said people forget that roads and bridges do not last forever. They will last 40 to 50 years depending on location. In West Texas with dry hard base they will last longer than in an area like Houston where clay subsoils do not hold up against constant pounding. Age, inflation, vehicle weights and added traffic volume are all factors. Nichols said that for more than a decade after the year 2000 the Legislature was given the task of meeting growing highway capacity and preservation needs without any new taxes. Tolling and local toll system financing were among the very few tools available that met that definition. "So that is what we did and legislators and the state's leadership at the time strongly supported it," he recalled. This chart is part of Sen. Nichols presentation showing the decline in the percentage of the total state budget going to transportation investment.